Get complete protection against viruses,security threats for 1 year without spending money. Now grab 1 year full-commercial license of Comodo Internet Security Pro 2011 worth $50. 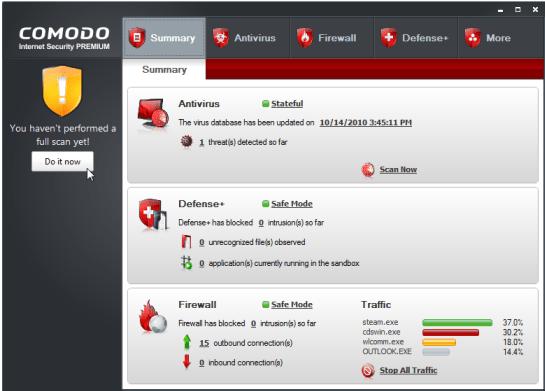 Comodo Internet Security Pro 2011 comes with $500 Virus-Free Guarantee,remote security and system support. This promotion is offered by downloadcrew.com. So if you are looking for free antivirus security then you can try this product. If a PC that has Comodo Internet Security Complete 2011 installed becomes infected with a virus or malware and cannot be restored to working condition by our support team, we will cover the cost of repair by a Comodo certified service up to $500. How to get 1 year Free license of Comodo Internet Security Pro 2011 ?